On this wonderful Friday, I thought I would share a movie that is providing me loads of inspiration these days. 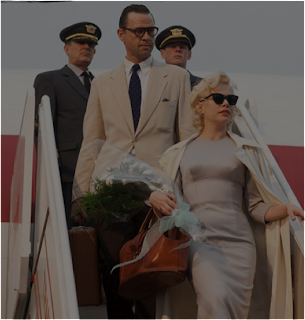 I saw My Week With Marilyn this week, and was blown away by Michelle Williams' performance, and the wardrobe for her portrayal as Ms. Monroe. 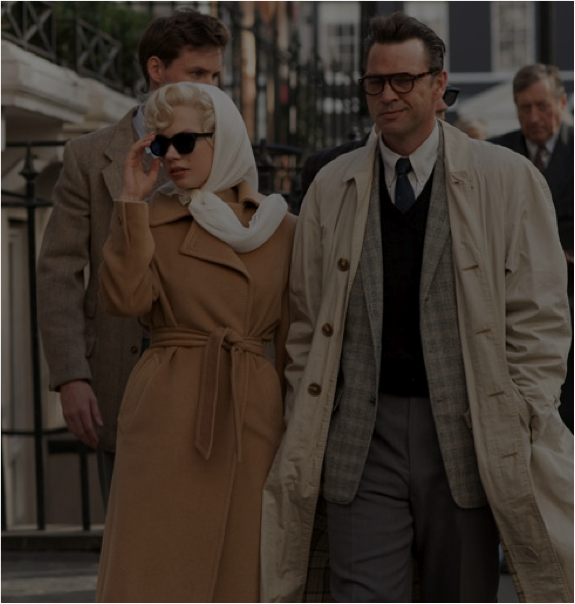 Despite how famous Marilyn is in Hollywood lore, I do not know much about her, and this movie was a beautifully made look into her complicated and glamourous life. have a great weekend full of new adventures! - Are you keeping your New Years' Resolutions? - I am fully on board with colored denim, and LOVING it! Thanks for reading, and have a fabulous weekend! I am looking forward to Tango lessons with Ty, an Art Crawl featuring free wine, and catching up with my to-do list these next couple of days! I've been wanting to see this movie but now I've definitely got to! Great ideas for classic style. Thanks for sharing! 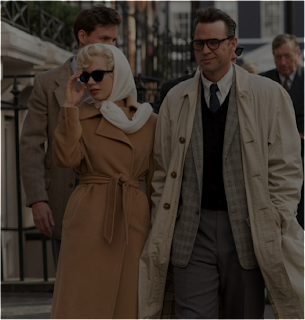 Looks like such a good movie, and the style is so inspiring. I feel like it would be so much fun to incorporate a bit of these pieces into my everyday wardrobe. Yes, put it on your list. It and Extremely Loud and Incredibly Close are the 2 best movies I have seen so far this year - and I see a lot of movies! Yes, put it on your list. It and Incredibly Loud and Uncomfortable Close are the 2 best movies I have seen so far this year - and I see a lot of movies! yes yes yes! I want to wrap myself in that camel coat right this second! definitely, this is one of the movies that now I actually want to go back and read the book. Michelle Williams is flawless as Marilyn... by the end I had almost forgotten and differences between Marilyn and Michelle's look! Oh I love this so much!! I want to see this movie and maybe draw more inspiration! The pieces in this movie are gorgeous. 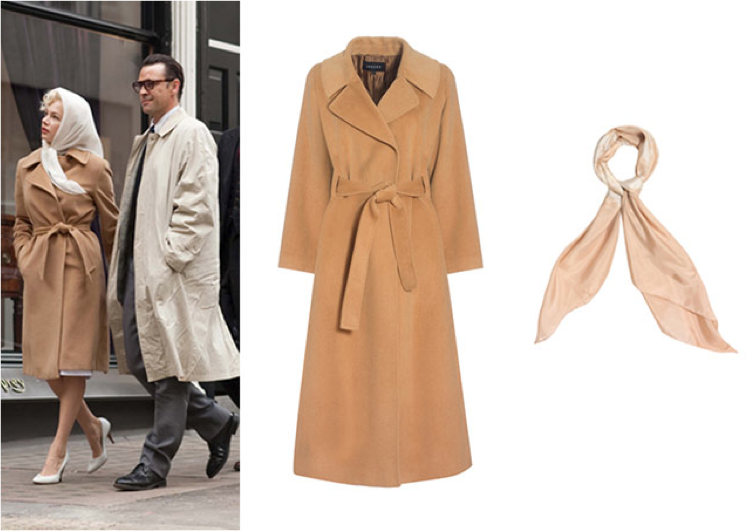 I love the coats and scarves! I need to see this movie! Now I also feel that I need to find some gingham pants! Yes! I loved her gingham pants! She made them look so chic! I can't wait to see this movie... I just read the book and it was SO good! *cries* This movie is a piece of crap. 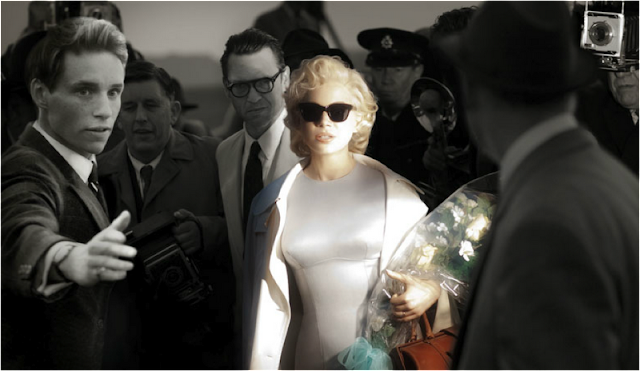 (Aside from Marilyn's effortlessly chic wardrobe, of course. The movie costumes are based on her real clothing.) Anyway, it is not a true story at all, no matter what Emma Watson says. (Really, like she was there.) Sadly, Marilyn Monroe was pregnant during the filming of "The Prince & The Showgirl", and she miscarried. I guess Colin Clark forgot that part in both his books, hmm? You're better off watching Marilyn in her own films. She was terrific! Marilyn wore those checked pants from the time of her 1940s modelling career to the day she died. She was so not about materialism and wanting possessions. I simply adore her!